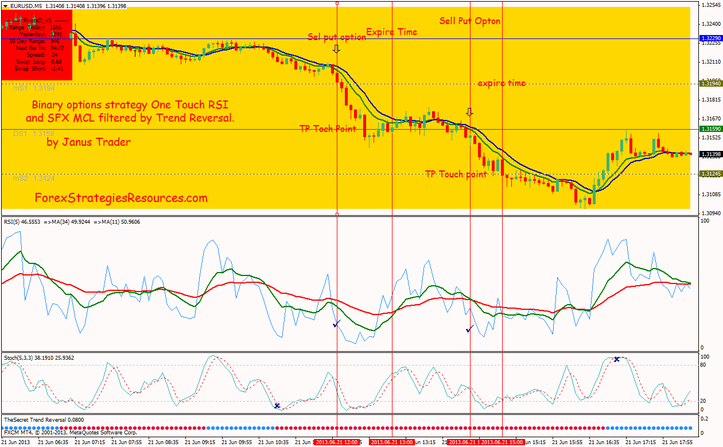 Binary options strategy One Touch RSI and SFX MCL filtered by Trend Reversal. This forex scalping system is also a good Binay options strategy One Touch. Also In this Binary Options Strategy Stochastic indicator is a great filter. Time Frame 5 min time expire 60 min. Time Frame 30 min Time wxpire 320 min. 30 min Time frame 22 pips or first or secod Pivot Points Levels in the market direction. This Options Binary Strategy High/Low have the same rules One Touch. Binary options strategy RSI and SFX MCL filtered by Trend Reversal. Trading System trend following with Three folter: Trend Reversal indicator, Stochastic indicator and RSI (5 period with two EMA).